Publish Or Perish? Yes and Never! One day in 1979, when my children were young, I attended an exhibition of handmade quilts. Created by a Pittsburgh craft guild called The Quilter’s Triangle, their intricate colors and narrative quality moved me to research the history of this unique and personal form of expression. As a mother and an illustrator, I was inspired to create a work of art for my children. It would reflect my new interest in quilts as it enriched awareness of our neighborhood and daily lives. So I created an illustrated alphabet that I decided to make into a quilted wall hanging. First, I drew and painted everything onto a large canvas. Then, I chose the stuffing and fabric backing materials that would be needed. Since my skills do not include needlework (except for the occasional darned sock), Mrs. Fava, an elderly Italian seamstress in my neighborhood helped me put it all together. At bedtime the next evening, I told my children the first of many stories about Stitchburgh, an imaginary world where everything is made from the colorful patches of an old quilt. In this original tale about a little blue goose named Fanny Featherbottom and her beloved Aunt Madras Goose, a writer, Madras’ stitchwriter suddenly breaks. Her story, now tangled into knots, is lost. 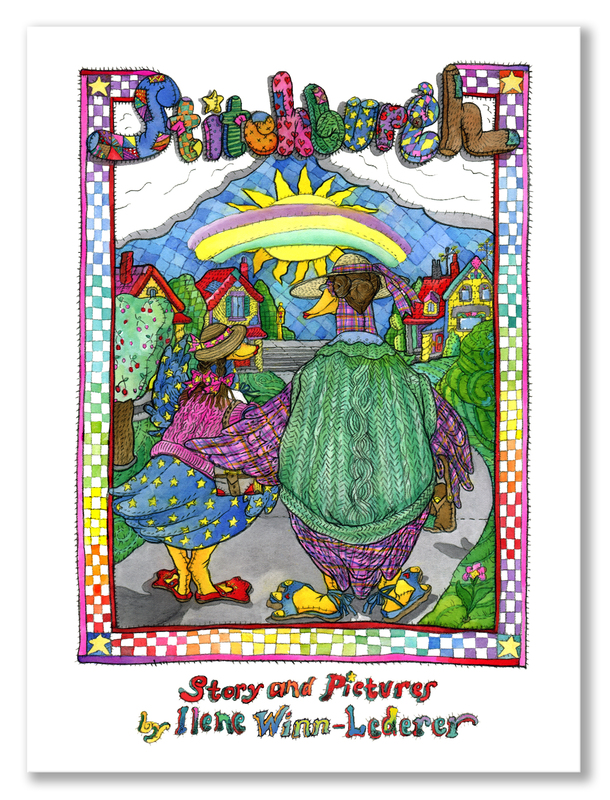 You are invited to follow the writer and her niece as they adventure around Stitchburgh in search for it and discover where good ideas are really found! After that quilting exhibition, it would be eighteen months before I finished the first illustrated version of Stitchburgh in 1980, but this version would be far from the last. After countless submissions and revisions of the illustrated manuscript by editors who were probably wondering what it would take to make me go away, I was sitting on a thick stack of rejection form letters from dozens of mainstream publishers and had reached the bottom of my proverbial barrel. Suddenly it hit me. Why waste my energy staying mad when I could put it to better use? So with renewed hope, I gathered up one of my illustrated manuscripts and made an appointment with a local commercial printer to see what was involved in publishing my ‘masterpiece’ on my own. When I explained to the print salesman what I wanted, he looked at me incredulously. ‘Just a small run of a full-color, 32-page children’s book? You have to be kidding; are you aware of the costs? I was beginning to get nervous as he listed everything necessary to publishing a book, from layouts to finished art, from films to plates and paper, to press time and bindery charges. I was sinking into my chair when he gave me the final figure. At the time, the minimum press run for a picture book was 5000 printed, bound copies of my book: $18,500. The huge quantity was necessary in order justify setting up the gigantic four color press and to establish a fair market price for each copy sold. In 1980, this was equivalent to a down payment on a modest home! ‘And,’ he added ominously, ‘that’s only the tip of the iceberg; what about the costs of marketing and distribution? How are you going to handle that? Stunned into silence, I imagined myself buried under a mountain of 5,000 books and quietly thanked him for his time. I slunk out of the office, feeling like a complete idiot. Never mind pursuing other bids on the job; they were all in the same ballpark. As I packed away my dreams and resumed my life as wife, mother, teacher and freelance illustrator, I was again discouraged, but still hoped that I could somehow, someday make it happen. Myriad other projects kept me busy over the years and in time, even as I illustrated other writer’s books for mainstream publishers, I cooked up some new ones of my own. During these years, print technology was advancing so that my early self-publishing experience would become an anachronism. While there had always been small private publishers snootily referred to as ‘vanity presses’ or ‘subsidy publishers’, authors who retained their services were not taken seriously. Rather, it became a stigma as their work was presumed to be substandard by the mainstream industry and therefore unpublishable. However, early in 2000, as I began to explore the growing self-publishing industry, the mystique associated with mainstream publishing became more transparent. With major changes in the tax laws and the decline of the world economy, authors were no longer treated as celebrities unless they were entertainment media stars or prominent political figures. We could no longer depend on publishers to cover the expenses of heavily promoting our books. With a few exceptions, it looked as though mainstream publishers were not much more than glorified printers with the presumed aura of ‘marketing caché. To make matters worse, the giant bookstore chains on whom they depended for their marketing and distribution venues were struggling financially. These began to close many of their brick and mortar establishments and not surprisingly, corporate mainstream publishing is quaking in its boots. In addition, self-publishing, with ‘print-on-demand’ technology at its core is a rapidly growing industry that, partnered with the vast online merchant network is proving to be their formidable competition. Happily, the vanity press stigma was being obliterated by the developing print technology because authors who became literate in its techniques could now publish their work with the newly emerging “print on demand’ industry. Though it would take me years to feel comfortable with the tools of computer aided design and sophisticated graphics software, I was fascinated to observe how these were driving a paradigm shift in the way books are produced, marketed and distributed. Last year alone (2010), 764,448 self-published titles appeared – an increase of 181 percent from 2008. That compares with 289,729 titles from traditional publishing houses. These numbers come from the R.R. Bowker Co., the agency that grants ISBN numbers and compiles the bibliographic data that must appear in your book before you can release it for distribution. Such information is necessary for booksellers and libraries to catalogue and identify your book in the vast publishing marketplace. Online companies such as CreateSpace, AuthorHouse, Blurb, Lulu, iUniverse and XLibris have made it relatively easy and affordable to put your ‘masterpiece’ out in the market. There are gigabytes of information out there comparing profit and loss to authors in both self and mainstream publishing, and you might want to look at these as you decide whether to self-publish or continue to submit your manuscripts to mainstream publishers. But numbers can be overwhelming and can do much to squelch your desire to venture into this market as an author. As a typical artist and writer consumed by their art, I gave these figures a cursory nod, shrugged my shoulders and became absorbed in my fantasy of self-publishing. I worked to enhance my technological skills and happily imagined the fame and fortune my efforts would generate. I published my first effort, The Alchymical Zoodiac: A Celestial Bestiary in 2009 under my own imprint, Imaginarius Editions.